Click a builder name to view their website. You can search this page for a specific state name to find a builder in your area. BlueSky MOD (Toronto, Canada) “We’re bringing together the concepts of high-design and low-impact,” says Hy Rosenberg, one of the company’s founders. “We believe that people should be able to take how they want to live and match it with where they want to live – without sacrificing functional or aesthetic standards.” BlueSky Mod’s prototype structure is a cottage retreat, designed to suite a variety of rural environments. “It’s an experiment in simplicity of design, construction techniques and relationship to nature,” says its designer, Todd Saunders, the widely published young architect, born and trained in Canada and currently working in Norway. Manufactured from mostly local and recycled materials and utilizing processes that minimize waste, the cabin is eco-friendly. Its Nordic-inspired design and angular cedar detailing also make it a definite eye-catcher. Cavco Industries (Goodyear, Arizona). We offer a variety of products including Manufactured Homes, Park Model Homes, Camping Cabins and Commercial Buildings. Cusato Cottages (Ocean Springs, Mississippi). Marianne Cusato founded Cusato Cottages to provide traditional designs for affordable housing. DPO Construction (Iowa City, Iowa). Builder of the first 5-Star rated energy efficient home in Iowa, Don Otto is passionate about making homes smaller and more energy efficient. 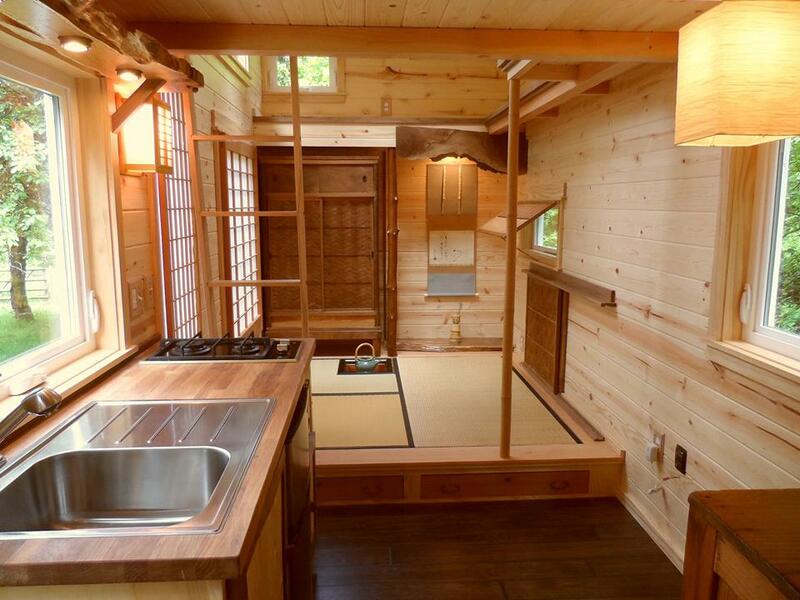 The home pictured at right is 1172 square feet — about 50% smaller than the average US home. Visually it’s not much larger than the attached two-car garage. The cost of heating and cooling for an entire year is estimated at about $150 per year! Despite its smaller size, the interior design is such that the home feels spacious and functions well. Quality materials, such as metal roofing, help reduce time and money on maintenance which further reduces the cost of ownership, and reduces the impact on the planet since home maintenance and repairs usually equate to additional environmental degradation. Insitebuilders (Archer, Florida). Provider of homes designed by Architect Dennis Fukai, PhD. These steel construction homes are small, cute, modern, and very strong. Website includes large photos, basic floor plans, and beautiful 3D model drawings. JalopyCabins.com (Pagosa Springs, Colorado). “Makers of unique small cabins, built with reclaimed materials.” Jalopy Cabins, located in Colorado, is taking a very different approach to building small housing. Our cabins are built from a creative vision by our builder and then assembled with reclaimed materials that we have available. Each cabin will be built using a minimum of 90% reclaimed materials and is truly a one of a kind structure. Jay Shafer (Boyes Hot Springs, California). Jay is a co-founder of the Small House Society and proprietor of TumbleweedHouses.com offering small pre-built homes as well as small house plans. For more information, please refer to Tumbleweed Tiny House Company further down on this list. JustCabins.co.nz (New Zealand). “We are passionate about what we do and will ensure that you are provided with the best possible service. Our cabins are in top condition, very warm, strong and painted in modern colours which will look great at your place. Our prices are so cost effective, and that’s got to be great for your pocket! We can deliver to suit you. We will level and connect on your site, making it all very easy.” Cabin builder in New Zealand. Katrina Cottages by Cusato Cottages (Ocean Springs, Mississippi). Marianne Cusato founded Cusato Cottages to provide traditional designs for affordable housing. More information is available on the New Urban Guild website. m-house (London, England). The m-house is modern, mobile, meticulous, minimalist, and marvelous! Mini Cabin Plans (Santa Cruz, California). Architect and builder Kevin Meek is the provider of this website that offers unique and inexpensive building plans for low cost housing. miniHome by Sustain.ca (Toronto, Canada). Beautiful small homes designed by Altius Architecture and Sustain Design Studio in Toronto, Canada. Norwester Industries (Spanaway, Washington). Provider of custom-built tiny portable homes. SingTinyHouse.com (McCleary, Washington). “Sing Tiny houses are lightweight, insulated, and durable. Our Tiny houses are constructed with Sing honeycomb panels. … The Sing home-building system started in 1992 as the founder/inventor Peter Sing patented his first vertical grain square log. There were already 24 patents under his name at that time. Since then, there have been a dozen more inventions related to home building products and methods and most are now in production as part of the Sing home-building system.” See also SingLogHomes.com and SuperHoneycomb.com for building materials. Steven Holl Architects (New York City, New York). Steven Holl founded Steven Holl Architects in New York in 1976. SHA is a design-oriented office, with a current staff of 35. The firm has been recognized internationally with numerous awards, publications and exhibitions for quality and excellence in design. Structures To Go (Port Angeles, Washington). Homes you can assemble! Home kits include locally-made plywood Structural Insulated Panels (SIPs). Titan Chicago (Chicago, Illinois). “Located in the heart of the American Midwest in Palatine, Illinois, Titan Home Builders is centrally located in North America, so that makes it easy for us to get your custom-made tiny house to you in record time. As a contracting and remodeling company focused on residential bathrooms and kitchens, we cut our teeth in the building industry beginning in 2010. As such, we are fully versed in all aspects of construction with knowledge and experience in design, electrical, carpentry, roofing, plumbing, painting, and more. When we first conceived of the idea of using our construction skills towards becoming the leading tiny house builder in the country, we never thought that they would be this popular with folks just like you. For those who are not only looking to disconnect from the grid, but who also want to drive as far away from it as possible, our tiny houses will not only get you there, but you will be completely self-sufficient when you arrive. Contact us today to discover exactly how easy it is to order your custom-made tiny house, and you will soon be enjoying the benefits of living in a tiny house in style.” The photo below shows the Titan team with the crew from Episode 304 of FYI’s Show “Tiny House Nation” and in the background is the home they built for the show. Van Wyk Woodbuilders (Des Moines, Iowa). Sharon and Shawn Van Wyk use high quality hand-picked lumber for the custom constructed cabins, carriage sheds, and other structures. Wooden Architecture (Frosinone, Italy). This is the website of Thomas Allocca, a designer and journalist promoting small, sustainable, and simple living. The designers and builders listed below seem to no longer be around, but we’re leaving them here in the directory for reference. Please contact us if you know of any other resources that should be added to this list. Defunct builder websites have been moved to the archives.